The online version of this article ( https://doi.org/10.1186/s13068-019-1423-x) contains supplementary material, which is available to authorized users. Cellulosic biomass represents a renewable, low-cost resource that can be converted into biofuels and biochemicals [1, 2]. Poplar, as a fast growing, widely distributed, short rotation period crop, is considered as a suitable feedstock for this process [3, 4]. 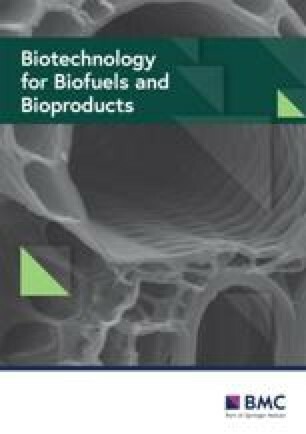 Enzymatic hydrolysis of poplar for the production of fermentable sugars, a key step for biofuels and biochemicals production, has been extensively investigated and different pretreatments, including ionic liquids, steam explosion, and acid/alkaline media, have been adopted to increase the accessibility of enzymes to polysaccharides [5, 6, 7, 8, 9, 10]. These pretreatments are usually conducted with high temperature or long time . Moreover, severe pretreatment could easily solubilize cellulose and xylan in poplar and made them hard to be recovered and utilized [7, 8, 10]. Therefore, efficiently utilization of polysaccharides in poplar still remains a challenge. Xylooligosaccharides (XOS), derived from xylan in lignocellulosic biomass by enzymatic and/or chemical hydrolysis, have important prebiotic properties and show great potential application in medicinal, food, and health fields . Recently, co-production of functional xylooligosaccharides and fermentable sugars from lignocellulosic materials by autohydrolysis, alkaline, and acid pretreatments has been reported [11, 12, 13, 14, 15, 16]. Acetic acid (AC) pretreatment offered a green approach to effectively convert corncobs, viscose fibers, and poplar to XOS and fermentable sugars [14, 15, 16]. It has been reported that a good XOS yield of 45.91% was obtained from corncob by AC pretreatment at pH 2.7 and 150 °C for 30 min . AC-pretreated poplar can produce a 36.0% XOS yield with 6.5% AC at 172 °C for 27 min with a clear increase (from 28.3 to 51.0%) of hydrolysis yield of AC-pretreated poplar by cellulases compared to poplar after autohydrolysis . Normally, AC can be used to remove lignin with high temperature and high AC concentration . However, after 6.5% AC pretreatment at 170 °C, the AC-pretreated poplar had high lignin content (> 30%) . A large amount of lignin in poplar is unfavorable for enzymatic hydrolysis . 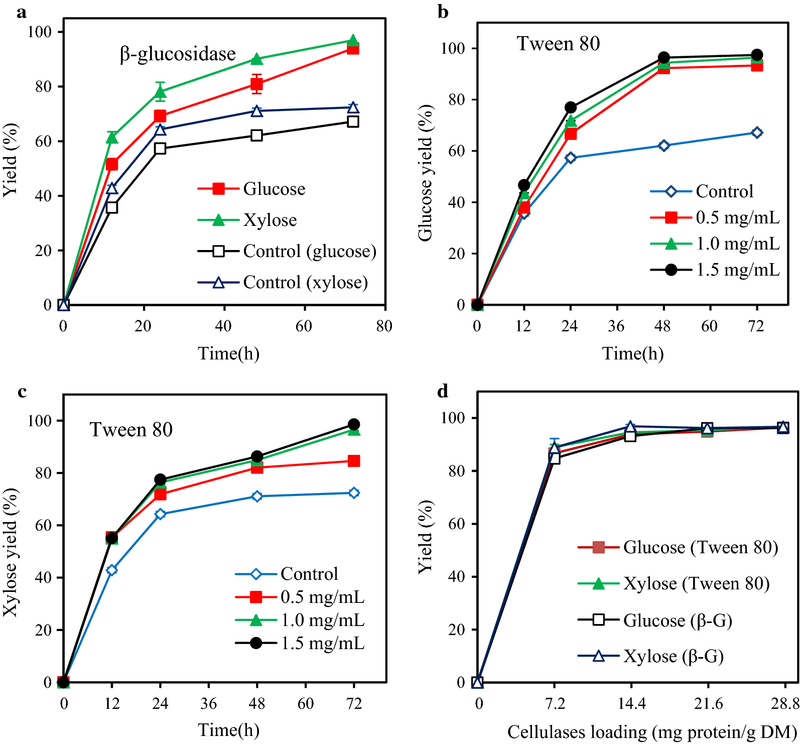 Thus, it is necessary to probe an effective method to alleviate lignin inhibition or to remove lignin to increase cellulases accessibility to cellulose in AC-pretreated poplar. The surfaces images of the raw and AC-pretreated poplar were characterized by SEM (Additional file 1: Fig. S5). The AC pretreatment resulted in less damage to the rigid structure of the raw poplar. Compared with the non-pretreated poplar, a plethora of spherical droplets was observed on the surfaces of the 5% and 10% AC-pretreated samples. These observations were in agreement with prior reports that the lignin droplets can be found on substrate after dilute acid pretreatment [27, 28, 29, 30]. Lignin droplets probably led to a low hydrolysis yield of AC-pretreated poplar because the lignin droplets formed by acid pretreatment strongly inhibited cellulose hydrolysis in biomass by steric hindrance and non-productive adsorption of enzymes [31, 32]. 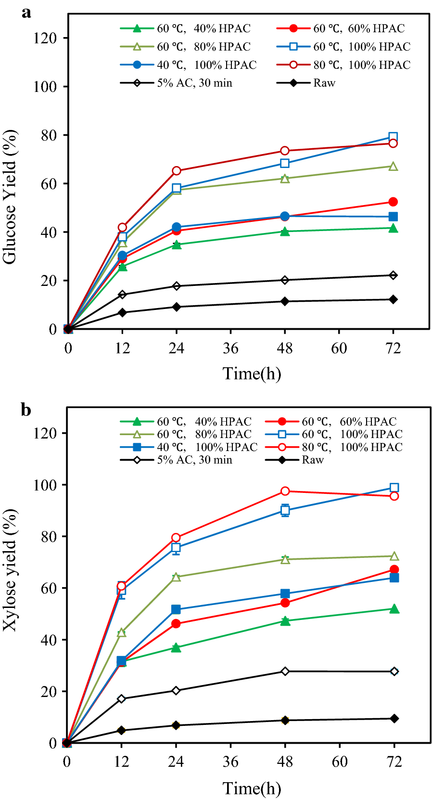 This work proposed a two-step pretreatment for the efficient production of XOS and fermented sugars from poplar and 6.9 g XOS, 40.3 g glucose and 8.9 g xylose could be produced from 100 g of poplar (Fig. 4). The AC and HPAC pretreated poplar presented remarkable hydrolysis yields of 86.6% glucose and 89.0% xylose at a cellulases loading of 7.2 mg/g DM and very high glucose (93.8%) and xylose (94.6%) yields were obtained with 14.3 mg protein of cellulases/g DM. The AC pretreatment and HPAC pretreatment were milder and more efficient than those associated with various typical poplar pretreatments (Table 6). Single step pretreatments such as steam explosion and those using alkaline peroxide or ionic liquids all require high temperatures and long treatment times and exhibit low enzymatic hydrolysis rates and poor conversion of certain components [6, 7, 8, 48, 49]. For example, only 60% enzymatic hydrolysis yield was obtained from poplar by a high temperature (210 °C) steam explosion pretreatment . In the sulfuric acid and steam explosion pretreatments, the first step poplar pretreatment condition was 0.7% H2SO4 at room temperature overnight and the second step pretreatment condition was steam explosion at 190 °C for 10 min and finally only 70% glucose yield was obtained by 72 h enzymatic hydrolysis with loading 32 mg cellulases/g DM . Additionally, two-step poplar pretreatments such as sodium hydroxide and sodium sulfate, white-rot and sodium hydroxide, sulfuric acid and steam explosion, sulfur dioxide steam explosion and ethanol can improve poplar hydrolysis yield, but the associated conditions are still very severe [5, 9, 10]. In this work, xylan in poplar was efficiently used for XOS production and glucan was almost completely hydrolysis. After AC pretreatment, the AC concentration in pretreatment liquor (5.2 mg/mL AC, 170 °C, 30 min) was 4.7 mg/mL (Additional file 1: Table S1). AC in the pretreatment liquor can be recycled by liquid–liquid extraction . During the HPAC pretreatment, the AC was consumed and peroxyacetic acid was formed. Pressure shift distillation coupled with a separation process was capable to separate AC and peroxyacetic acid in HPAC pretreatment liquor [51, 52]. The two-step pretreatment of AC and HPAC provided a preferable feature to prepare XOS and monosaccharides from poplar with relatively mild conditions, showing great potential application in industrial production of XOS, biofuels, and biochemicals from biomass. Additional file 1: Table S1. The AC concentration and recovery of AC pretreatment liquor. Figure S1. XRD analysis of raw and two steps treated. Figure S2. FT-IR spectrum of raw and two steps pretreated poplar. Figure S3. XPS analysis of raw and two steps pretreated poplar. Figure S4. Hydrophobicity of raw and two steps pretreated poplar. Figure S5. SEM analysis of raw and two steps pretreated poplar. Figure S6. 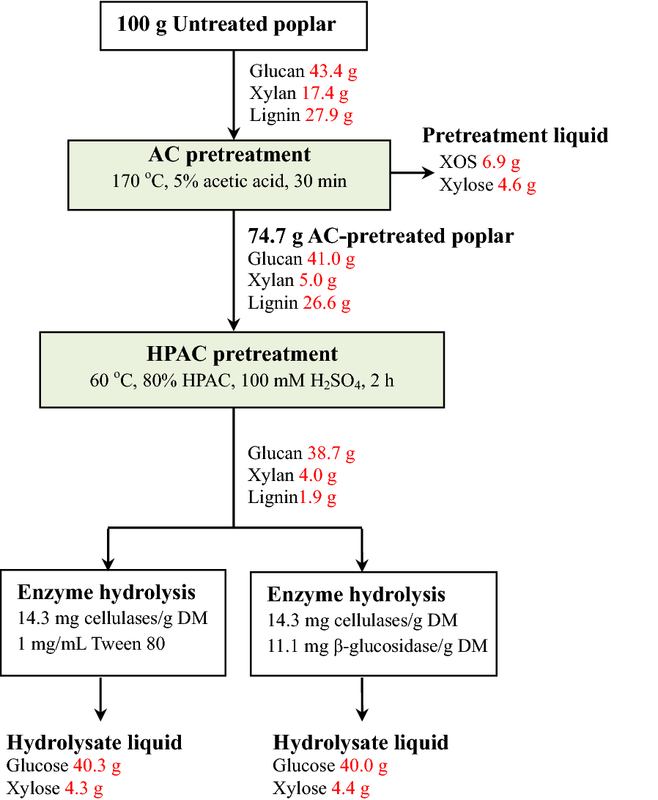 Effect of CTec2 loading on the hydrolysis of poplar (2%) pretreated by AC (5%, 170 °C, 30 min) for 48 h.